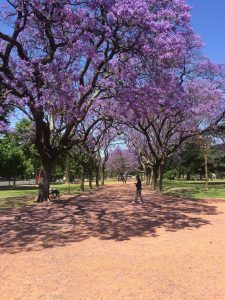 Elebaires Spanish Language School > Blog > Culture > BeAutiful Buenos Aires, soak up the sun and study Spanish! BeAutiful Buenos Aires, soak up the sun and study Spanish! Buenos Aires, a Ja ck of all trades. I really cannot think of a better way to spend the Latino summer then learning to speak Spanish in this wonderful place. The city is bursting from the seams with exciting things to do and explore. From Tango to Polo, it has it all, not to mention the stunning parks, delicious asados and magnificent Malbec. Muy Rico! Elebaires Spanish school https://www.elebaires.com/ offers a professional Spanish course tailored to your ability, but importantly they ensure you experience all the cultural ‘must do’s’ to get the most out of your time in Buenos Aires. Strolling down the city’s avenidas in the summer sun, or stumbling across a Milonga in San Telmo’s old plaza promises to be an enchanting experience. The city oozes an incredible history and it is only a stones throw away from Uruguay; there is no room for boredom in this eclectic place. Your experience of the Spanish language is enhanced when studying in Buenos Aires as there is never a dull moment in the Argentine capital. For me, the city couples the thrill of diving into the unknown with a cosmopolitan flare that ensures there is something for everyone whatever your interests. Immersing yourself in South American culture helps you gain an understanding of the language and its history, and speaking Spanish with the locals is a special experience quite like no other. Elebaires provides an exciting community in which it’s students live the magic of a porteño summer. I don’t want to spoil anymore of the surprises this vibrant city has in store, so come and check it out, it promises not to disappoint!